SCP-1353. Picture taken before title manifestation. Special Containment Procedures: SCP-1353 is placed in the center of a 12' x 12' room on a 4' x 4' reading desk. No personnel may approach within 6 feet unless instructed by the assigned research director. No Fewer than 2 guards may be posted at a time. All appointed guards must remain outside of room. Video surveillance is to be used strictly in order to monitor SCP-1353. Transportation of SCP-1353 must be carried out in a box or wrapping lined with Telekill alloy and handled by no fewer than 2 couriers at any time. All guards who attempt to read from SCP-1353 without express permission from the assigned research director are to be demoted and reassigned. Description: SCP-1353 was found on a shelf in a library by Agent ████ and Agent ████ during the recovery of SCP-███. Upon transportation, Agent ████ quickly fell into depression and committed suicide en-route to site 14. 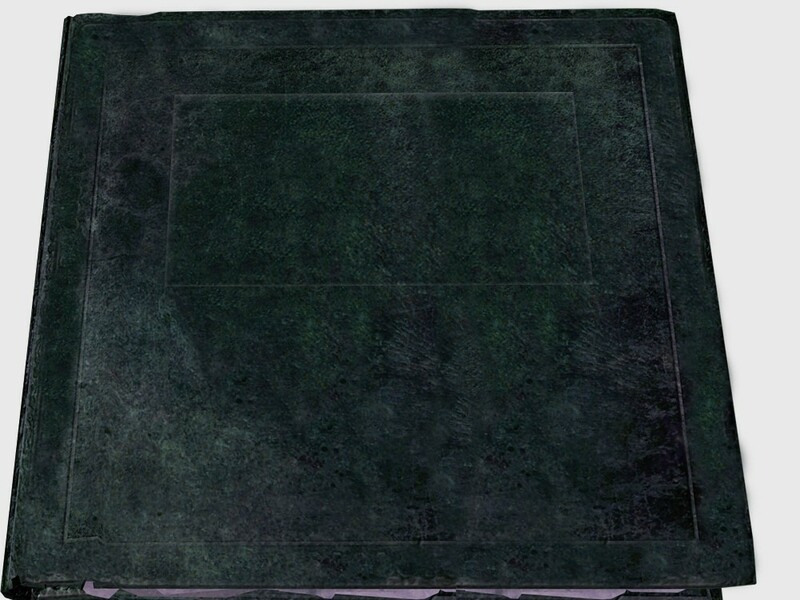 SCP-1353 is a large leather-bound book or tome. Object is 16" wide, 12" in length, and 4" thick. The leather itself is has a dark green hue. Analysis of binding has yielded zero matches to known fauna. Object is rough, appears aged and worn. On the cover there is a large, blank box where a title should be. SCP-1353 is inanimate and mundane until approached within 6 feet by a sentient entity or person. After 10-28 minutes of exposure, a title appears in the 'title area' on the face of SCP-1353. The title of the tome and its contents are unique to each person. If the sentient person or entity is moved beyond 6 feet of SCP-1353, the writing fades. SCP-1353's contents appears to be a thorough autobiography conducted in the first person of the exposed (This person will now be referred as SCP-1353-1). Once SCP-1353 acquires a title, another person may approach and read from SCP-1353 without sustaining physical or mental trauma. SCP-1353-1 are always attracted by the unique cover title of SCP-1353, often expressing great interest in the theme. Upon reading, SCP-1353-1 often skim the pages, with varying facial expressions and emotions in each individual. After a few minutes into reading, SCP-1353-1 becomes distressed and closes the book. Within 96 hours: SCP-1353-1 will either commit suicide or die in some other fashion - ranging from heart attacks, strokes, internal hemorrhaging, and in 2 instances ████████. Reviewing of SCP-1353 during autobiographical manifestation yields a bland yet informative history of SCP-1353-1 ending one day before encounter with SCP-1353. Cause of distress unknown.